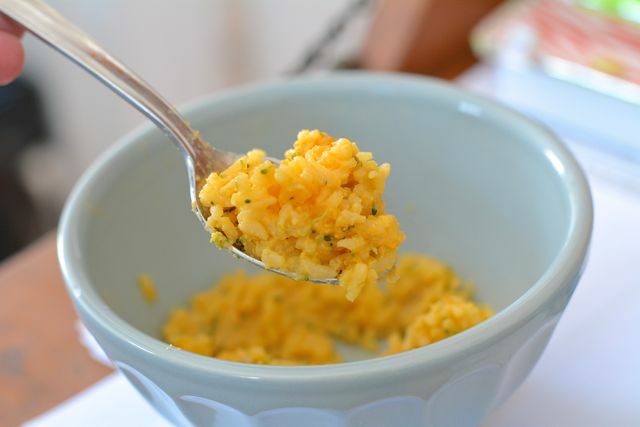 I’ve always considered mac and cheese the ultimate comfort food, and this cheesy rice recipe is a natural extension of that. It is warm and gooey and perfectly filling when you are in need of a rich meal. I started making this for my kids too, and they adore it. It is a nice departure from pasta and is even good for those who need to eat gluten free! The best part is that it comes together very quickly. The prep takes just minutes, and there is no need to whip up any complicated sauce. Sometimes I add chopped broccoli or another cooked vegetable to it for a little extra fiber. The kids don’t mind—it is one more way to get them to eat their greens. When I load it up with broccoli or spinach (or both! ), I find this works well as a main course. But if you want more you can always pair it with a piece of meat or fish and have a wonderfully satisfying meal. Gluten sensitive? Try my kids' favorite comfort food instead. Step 1: Bring the rice, water, and milk to a boil. Step 2: Reduce the heat and simmer for 20 minutes or until the rice is cooked. Step 3: Stir in the cheeses, broccoli, and pepper until the cheese has completely melted. Serve hot. *You can use whatever cheese you prefer. I find a strongly flavored cheddar, gruyere, or havarti are my family's favorites. Make sure to use cheeses that melt well.